Apple has its smoking gun. When the iPhone shipped back in 2007, it caused panic at the Korean consumer electronics giant and there is written proof, penned by the company’s executive in charge of mobile, that Samsung saw the iPhone as the template for its future smartphones. The Samsung design crisis of 2007 has come home to roost. Lawyers for the Korean electronics giants made a huge error in court on Monday — they mentioned Samsung’s “crisis of design,” an idea laid out in a damning internal memo from 2007 that the judge previously refused to allow into evidence, and Apple pounced. Here are some of the more damning statements made by JK Shinn, Samsung’s executive in charge of mobile. • Influential figures outside the company come across the iPhone, and they point out that ‘Samsung is dozing off.’ All this time we’ve been paying all our attention to Nokia, and concentrated our efforts on things like Folder, Bar, Slide. Yet when our UX is compared to the unexpected competitor Apple’s iPhone, the difference is truly that of Heaven and Earth. It’s a crisis of design. • I hear things like this: Let’s make something like the iPhone. • When everybody (both consumers and the industry) talk about UX, they weigh it against the iPhone. The iPhone has become the standard. That’s how things are already. • Do you know how difficult the Omnia is to use? When you compare the 2007 version of the iPhone with our current Omnia, can you honestly say the Omnia is better? If you compare the UX with the iPhone, it’s a difference between Heaven and Earth. Now, Samsung’s lawyers will have to move “heaven and earth” to save their client and prevent total victory for Apple. With such damning, direct quotes from a Samsung executive now in evidence, $2.5 billion (the amount Apple is seeking in damages) might seem a small price to pay in order to staunch the bleeding. 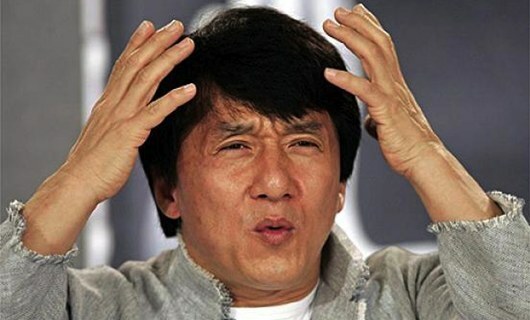 Image Fairer Platform, Jackie Chan makes the ultimate WTF face.